Home » » Man Wins N9,700,000 on BetKing Sports. Man Wins N9,700,000 on BetKing Sports. 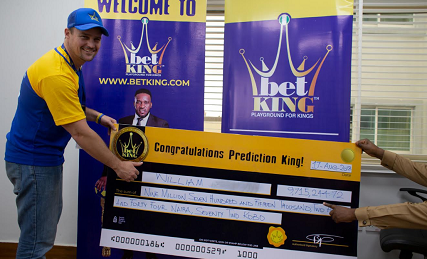 A middle-aged man, William, has emerged winner of a whopping sum of 9.7 million Naira on Nigeria’s fastest growing sports betting company, BetKing. William proved to be a true prediction King when he staked the sum of N10,000 on a ticket with 15 selections from several soccer leagues and nailed all 15 to win a complete sum of N9,715,244.72. He was invited to BetKing head office to claim his winnings and was paid instantly. He was very enthusiastic during a brief interview session as he spoke about playing for the love of sports and how Nigeria’s top betting site, BetKing, made his predictions easier by providing up to date statistics on each of the teams before he placed his bets. He further commended the platform for how easy it was to use as well as the exciting markets available for customers to bet on. Speaking further, he mentioned how his faith in the brand was more solidified as he got paid as quickly as possible. According to him, “BetKing has contributed to paying my children’s school fees this session.” He also plans to complete a couple of pending projects with the bulk of his winnings and he expressed gratitude to the brand for giving him the opportunity. It is noteworthy that this win comes after previously reported big wins of N500,000 jackpot, N3 million and N7.7 million on the BetKing platform. With a recent win of N9.7 million, it appears that bigger wins will keep emerging from the playground for Kings. BetKing is a popular sports betting company that launched on February 22, 2018, in Lagos, offering online services nationwide and agency services in several states within Nigeria. With headquarters in Lagos State, BetKing is working towards a nationwide expansion that places several physical shops across all states in Nigeria. Among the offerings of the company’s services are sports betting, not restricted to football, hockey, cricket, tennis, basketball and more, customised state-of-the-art virtual games including the exclusively designed sports Kings’ League.